When it comes to supplier risk, understanding the financial strength of your suppliers is crucial to managing the supply chain. Today, more businesses recognize that even small supplier disruptions can result in losses to their own revenue, customer satisfaction or credibility. 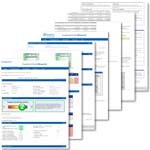 Supplier Check Reports from Experian provide a financial health check on your suppliers, giving you instant access to trusted information you need. Get the information you need now, at affordable prices (no contracts or subscriptions required). 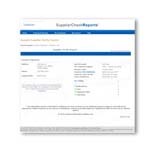 Supplier Check Reports are easy-to-read reports containing trusted supplier business information from Experian. 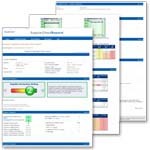 Supplier Check Reports help you evaluate a supplier’s risk of business failure. Reports include pertinent information such as risk ratings, payment histories, rising delinquencies, severe delinquency indicators on key account types, probability of business failure, records of legal judgments, and industry financial statistics.